Seurasaari Island and Open-Air Museum and Sea Fortress Suomenlinna will appeal to history buffs. 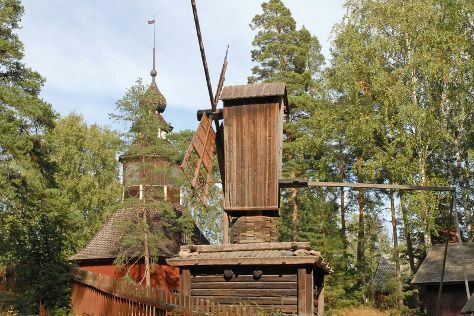 Do some cultural sightseeing at Rock Church and Stromforsin ruukki. You'll find plenty of places to visit near Helsinki: Pyhtaa Church of Saint Henry (in Pyhtaa), Linden Esplanade (in Kotka) and Hvittrask (in Kirkkonummi). Next up on the itinerary: relax and rejuvenate at some of the top local wellness centers, don't miss a visit to Hakaniemi Market, explore the world behind art at Museum of Contemporary Art Kiasma, and take in the spiritual surroundings of Uspenskin Cathedral (Uspenskin Katedraali). To see ratings, photos, and more tourist information, you can read our Helsinki online trip itinerary builder . If you are flying in from Canada, the closest major airport is Helsinki Vantaa Airport. In September, plan for daily highs up to 19°C, and evening lows to 8°C. Finish up your sightseeing early on the 27th (Fri) so you can travel back home.